Lexus executives forecast 17,000 UX sales in first full year in U.S. The UX delivers a fine interior, compelling exterior styling and competitive powertrains at a great price. It is clear the UX has more than a decent shot at success. STOCKHOLM, Sweden – Crossovers and SUVs make up 70% of U.S. sales for Lexus, so it should come as no surprise that Toyota’s luxury brand is expanding its lineup with an “urban explorer” slotting below the NX in both size and price. The all-new UX, beginning production now in Kyushu, Japan, in anticipation of a U.S. sales launch in late December, will compete in the Small Luxury CUV segment – one of the industry’s fastest-growing sectors. After a day behind the wheel of this cute ute that now represents the entry point into the Lexus brand, it is clear the UX has more than a decent shot at success. Lexus executives forecast 17,000 UX sales in its first full year in the U.S. In the recently ended ’18 model year, the BMW X1 led the lot, with 32,075 deliveries, followed by the Mercedes-Benz GLA (24,322), Audi Q3 (20,610), Volvo XC40 (9,033), Infiniti QX30 (8,751) and Jaguar E-Pace (2,808), according to Wards Intelligence data. Two other late entries into the segment are the BMW X2, which tallied 10,907 deliveries in ’18, and the Cadillac XT4, which is arriving now in showrooms. But there’s room for new entries: The ’18 model year ended with Small Luxury CUV sales up 24.7% at a time when light trucks overall rose only 7.3% and car sales were down 13.4%. This growing segment is all about affordable, functional efficiency, and none of these vehicles will excite with neck-snapping thrust. So the UX seeks to set itself apart from the pack with edgy styling inside and out. 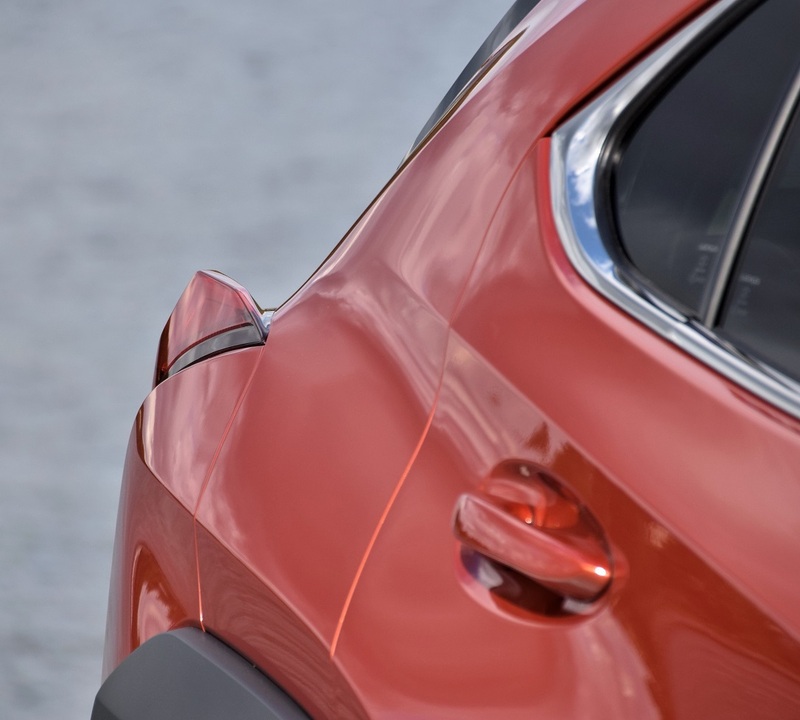 The windshield is steeply raked like that of a sporty coupe, and the taillamps jut (almost awkwardly) from the rear haunches, protruding like budding antlers (see photo, below left). The fearsome trapezoidal grille that has won more critics than fans carries over from other Lexus models and now has been updated to improve aerodynamics. The low ride height and center of gravity suggest few owners will take it off-road, although the cladded wheel wells (also designed for better aerodynamics) bear a striking resemblance to those adorning the Jeep Compass, oddly enough. It’s inside where the UX shines, with impeccable build quality and seats beautifully stitched and striped to envelop the shoulders and waist. Interior color offerings in the U.S. will accommodate those who want to look beyond the predictable (but still popular) black. Glazed Caramel is warm and inviting, but the most fetching interior color combination is the off-white Birch and Lapis blue, which can be had in both leather or fabric (see interior photo, lower left). Want something bolder? Opt for Circuit Red leather with black accents in the UX F Sport adaptation, or all black with hot tomato red stitching. 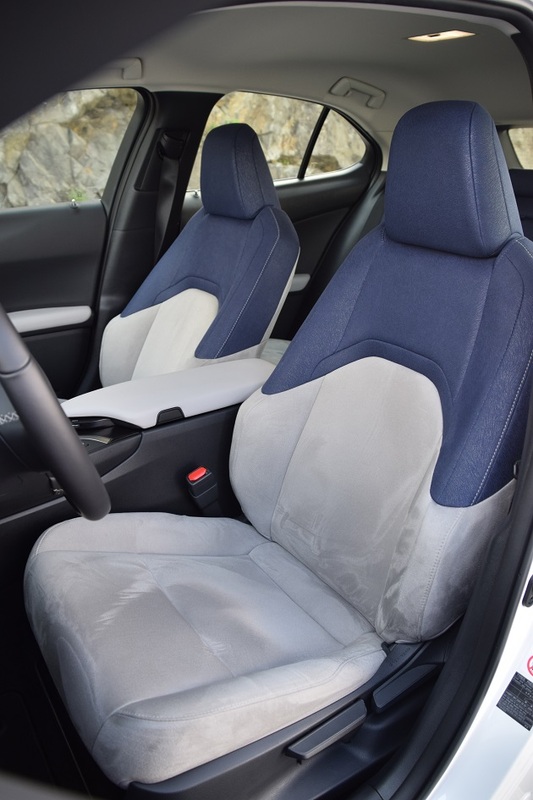 Creative uses of color make the UX interior memorable: In models featuring Lapis/Birch, part of the upper instrument panel is beautifully finished with blue trim that matches the seat color, tying together the overall aesthetic. In other markets, a solid off-white interior is punctuated with handsome brown trim to finish the upper instrument panel. The upgraded Lexus Multimedia System resides on an upgraded, high-resolution 10.25-in. (26-cm) display that serves as the visual center of the interior. In addition to voice commands, the driver or front passenger can interact with the screen via the Remote Touch Interface, a control touchpad with haptic feedback in the center console, a similar setup to other Lexus models. But the UX also offers a new interface directly next to the touchpad. This cleverly designed module lets the driver (or left-handed passenger) use rotary dials to adjust radio volume, change stations or press buttons to switch between media or radio offerings. A palm rest makes for excellent ergonomics. Standard in the UX are four USB ports, and a 4GB WiFi Hotspot offered as part of Lexus Enform telematics service allows a user device to become an internet access point. The UX springs from Toyota’s GAC global architecture for front-wheel-drive cars, including the Corolla, Prius and C-HR. The UX represents the first Lexus on this platform. Aluminum is used for the UX’s side doors, fenders and hood and composite materials for the tailgate. The U.S. gets two powertrain offerings, both 2.0L naturally aspirated 4-cyl. engines from the same Dynamic Force family that launched last year with the new Camry. The front-wheel-drive UX 200, with 169 hp, uses the same M20A-FKS engine as the ’19 Toyota Corolla Hatchback, with both port and direct fuel injection. A CVT is standard, with a fixed first gear and the ability to simulate additional gears through manual shifting. The all-wheel-drive UX 250h hybrid, with total output of 181 hp, gets the M20A-FXS version of the 2.0L with a higher compression ratio (14.0:1) and impressive 40% thermal efficiency. This series-parallel hybrid employs a hybrid transmission with two motor-generators and a planetary power-split device similar to that used in the Lexus EX hybrid sedan. One motor-generator starts the engine and controls engine speed, while the other drives the front wheels and governs regenerative braking. Standard on the hybrid, all-wheel drive is enabled by a third electric motor-generator in the rear differential. The vehicle’s anti-skid stability control system distributes power between the front and rear axles when accelerating, cornering or on slick or steep surfaces. AWD on the UX only works at speeds up to 43 mph (69 km/h), resulting in lower fuel consumption. Lexus expects an even split between customers opting for the standard UX 200 and hybrid UX 250h. 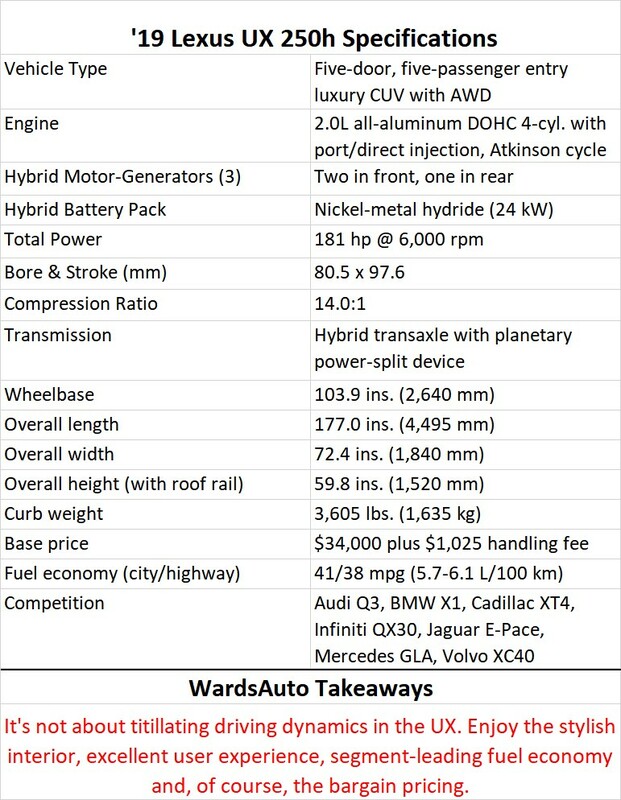 Both powertrains are capable and smooth but generally unremarkable. With either powertrain, the UX is not about 0-60 speed (nearly 9 seconds) but about fuel economy and efficient motoring. The automaker declares the UX 250h the most fuel-efficient utility vehicle in America without a plug, rated by the EPA at 41/38 mpg (5.7-6.1 L/100 km) in city/highway driving. Pricing starts at $32,000 for the UX 200 (available in December) and $34,000 for the 250h (available in January). F Sport trim versions of both models are available for another $2,000. Tack on another $1,025 in handling fees. The UX delivers a fine interior, compelling exterior styling and competitive powertrains at a great price. Here in the land of the Abba Museum, Lexus bosses can rest assured customers will take a chance on the all-new UX.